Any interior design scheme needs to take into account interior doors and frames. As a significant design element, they not only need to be worked into the overall circulation plan of the building, but they also need to function reliably, hold up over time, and look good doing it. The doors and frames are arguably one of the most used parts of building construction, with a regular flow of people, equipment, furniture, carts, or other things touching and passing through them, usually daily. If they are treated simply as a commodity without proper attention, they can potentially become a worn eyesore in an otherwise beautiful facility. Paying attention to the details of the doors and frames helps to ensure that entire interior openings can both become a notable design feature and a functional part of the building that keeps working and looking good over time. Selecting impact resistant interior doors that withstand wear and impact in high-traffic interiors starts by understanding some of the differences in the way doors are constructed. Most have a solid core of a variety of durable materials. Part of the difference comes from what that core is covered in, usually as a lamination over the core. The more durable and wear resistant that the covering is, the more wear resistant the door will appear. Another difference is the door edge. A common manufacturing approach is to simply band the edge of the door with the same material as the faces. That seems logical but doesn’t acknowledge the fact that the edges are the most likely place for wear and damage to occur. At least one manufacturer has addressed this by creating field replaceable rounded edges and stiles for extra impact protection. This not only helps to strengthen the door, but it also makes for quick and easy edge replacement in the event that the level of damage warrants it. This obviously costs less than replacing the entire door with no downtime or disruption to the facility, helping the doors continue to look as good as the day they were installed. Door frames are the other piece of interior doors that need to be addressed. Commonly, hollow metal frames are used to secure the door to surrounding walls and provide a visual surround for the opening. The frames are subject to wear and damage as well of course, so being sure they are installed and anchored correctly is important, but so is the way they are finished. With some manufacturers, it is possible to specify the same type of rugged lamination over door frames as is used on the doors. This not only assures good durability, but it also allows the design of the entire opening to be coordinated in terms of colors and finished appearance. The covering material can also be selected as a field-replaceable item if it is ever damaged. From an aesthetics standpoint, both doors and frames products are available in laminations that include numerous designer colors and woodgrain patterns to suit a wide range of interior design schemes. For extra design and customization, it is also possible to have custom graphics included on the doors. This feature allows photography, branding, wayfinding, customer patterns, illustrations, etc. to be included on the doors without sacrificing durability at interior openings. Interior doors and frames can be selected as part of an overall interior design scheme for aesthetic appeal and for durability to hold up over time with heavy usage as shown here in Hotel Nikko, located in the heart of San Francisco’s Union Square. While many interior innovations can take place in the larger components of a design, they can also be found in specific specialty areas of a building too. One of the areas that necessarily receives a lot of design attention is bathrooms and specifically shower areas. Many creative designers are working shower spaces into a larger overall design scheme not only in residential or hospitality locations but also in workplace environments for people who ride bicycles to work or otherwise engage in physical activity. The proclivity toward high design and the need for functionality, durability, and accessibility has created a trend toward wall and floor surfaces to visually flow between shower stalls and the surrounding room, often through the use of ceramic tile or similar materials. Of course, shower floors need to allow the proper flow of water too, so combining that function with the visual goals is paramount. The means to provide a successful specialty shower design starts with everything that is underneath the tile. The floor obviously needs to be waterproof and sloped either to the center, one side, or in a custom configuration to direct water to a drain. That drain can be shaped, sized, and covered in a variety of ways that impact the appearance as well as the function, such as a square, round, linear, or custom shape. The waterproofing needs to be consistent around the drain as well as along the edges where the floor and the wall meet. All of these things need to be properly worked out, detailed, and installed before the tile is installed to create the finished appearance. Some manufacturers have created specialty systems for shower floors that address all of the needed functional requirements, thus allowing designers to take advantage of this expertise by specifying a fully coordinated and functional system. Some have paired with specialty drain companies to provide a full range of drain types and looks, including some that are very sleek, contemporary, and easy to blend into a larger design scheme. This single-source capability means designers, contractors, and owners don’t need to worry about proper integration of different manufactured products and systems, or about who is responsible for the waterproofing if an issue does arise. It also relieves designers and contractors from coordinating and sourcing all of the components so they can focus on other things. The actual drain is usually the part that is visible due to the use of a metal covering over the top that is flush with the surrounding floor finish. This can be an understated item or a visual feature depending on the design needs of the shower area. The drain cover can be selected in a variety of metal finishes and colors but also in a number of patterns of perforations. Some can provide very demure linear patterns, while others can be more geometric with different design vocabularies. If the drain is appropriately placed in the floor of the shower, it becomes very easy to provide an accessible shower stall or room that will allow a wheelchair to be rolled in without being impeded by a raised element. In addition to providing the actual drain component, such a coordinated system includes a pitched floor substrate (i.e., rigid foam or other material), an approved tile backerboard, and waterproofing membranes, all of which is typically lightweight, waterproof, and vapor retardant for wet areas. The linear drain channel typically has a waterproofing membrane preapplied to the flange in the factory and is internally sloped. It can also be provided with a drain support to allow the plumber to easily level the linear drain despite its pitched channel. Such a drain and support system allows a plumber to set the drain, level it, and have the next tradesmen seamlessly pick up on the next phase of installation. A pre-pitched shower floor system is also typically pre-waterproofed in the factory, which requires the installer to only waterproof the seams where the walls meet the floors. This can reduce the overall installation time by one or two days, thus saving on labor and installation costs. The use of carefully selected wall boards, floors, and waterproofing membrane in the system allows for tile to be installed directly on the surface, without the use of an additional mortar bed. Because such a coordinated system is predictable and minimizes risk of leakage, it is available with a limited warranty of up to 10 years. That can provide peace of mind not only to the designers and contractors but also to the building owners or tenants. Images courtesy of Infinity Drain Ltd. 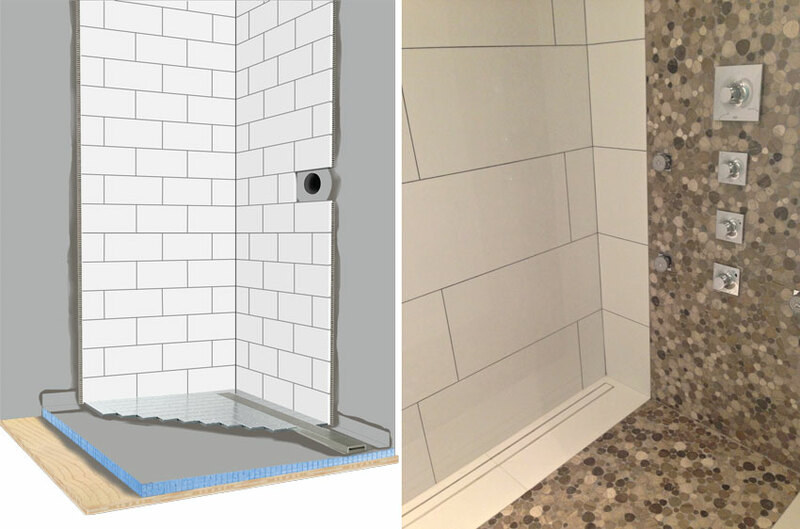 The design of shower areas in residential or commercial settings is streamlined by the use of complete shower systems that include waterproofed pitched floor substrates and tile backerboard as well as the decorative shower drain. The shower can be finished with tile or other materials, and the drain cover can be incorporated into the design as seen in the linear drain near the wall shown here. With everything else in place in a successful interior design, the final step is the finishing touches and details. This applies in particular to architectural hardware not only used on walls or doors but specifically integrated into furniture and fixtures in a space. This can be true for some conventional things like drawer pulls, cabinet handles, and wall hooks that are used throughout many building types. Some specialty hardware companies provide these conventional items but also some very innovative products that offer convenience and operability. In particular, selected hardware that addresses wire management and power supply for portable consumer electronics, such as cell phones and other devices, can not only make a space more user friendly and functional, but it also has the ability to integrate this functionality into an overall design scheme. Successfully selecting architectural hardware from a wide range of choices usually involves finding the balance between form and function. Manufacturers focus on providing solutions for a specific need while being sensitive to overall design aesthetics and the ability to complement furniture pieces. They also recognize that hardware is not limited literally to nuts and bolts. Rather, architectural hardware is created through intensive, solution-based industrial design. They have applied that expertise directly to current design issues in furniture and fixtures, such as ergonomics. Among the things that architectural hardware has been used for, the biggest impact on the world of design has come through effective wire management and power supply. With the growing plethora of handheld devices, laptops, computers, small appliances, and other things that need power or data connections, the need to run wires from these devices to outlets has similarly grown. The trend has been not to rely on wall outlets alone but rather to incorporate such outlets within a manufactured piece of hardware that can be installed in furniture or fixtures and then powered back to a wall. This simple concept has evolved over the years, with these types of power and communication systems revolutionizing convenient power access in all areas of design. For example, there are power grommets and other products available that can be recessed, hideaway, flip up, edge mount, and many other styles that mount directly into any type of furniture. These units provide power at the surface level where it is needed, preventing people from having to crawl under a desk or other furniture to find an outlet. This approach has provided practical power and data solutions for things like conference tables, work desks, library study carrels, and even community charging stations in public or commercial buildings. It has also helped with other facets of daily life, such as kitchen islands and bedroom furniture in residential and hospitality settings. The ability to create sleek hardware designs that fit into any furniture and add value has been part of the reason for the growth of this type of architectural hardware. Specialty architectural hardware can be used in interior designs for conventional reasons like drawer pulls or for a full range of innovative ways to manage wire and power for consumer electronics, appliances, or computers. Introducing the Frank Lloyd Wright® Signature Decorative Grille Collection: a collaboration with the Frank Lloyd Wright® Foundation to produce premium HVAC grille covers in a variety of patterns inspired by Frank Lloyd Wright’s designs and architecture. Fabricated using post-consumer 94 percent recycled aluminum with several finishing options. Stock and custom sizes available. Acrovyn® Doors & Frames were designed with high-impact areas in mind. Architects and designers choose our doors and frames for their extensive design options and their ability to withstand heavy facility traffic. 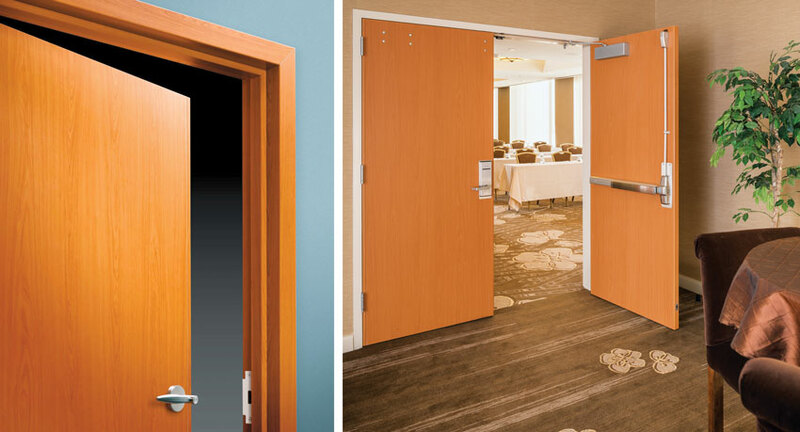 Clad with ultra-durable Acrovyn® and featuring field-replaceable components, Acrovyn Doors & Frames will keep your entire opening looking like new. PCS77 provides power on kitchen countertops or other wet areas. It pops up for access, then hides away when not in use. The product is watertight, spring loaded, and GFCI protected and includes tamper-resistant outlets. Power where you want it, when you want it. Developed by USG and Infinity Drain,™ this offers a waterproofed, linear drain shower system that’s easier and faster to install than traditional shower construction. This innovative system pairs USG Durock™ brand shower system components with linear drains from Infinity Drain.™ It’s one complete waterproof shower installation made easy. With Aspex® Printed Wall Protection, you have the high-impact durability of IPC® Rigid Sheet with the clear, crisp imagery of digital printing. Because your graphic is back-printed onto the clear sheet, you don’t have to worry about the image being scratched over time. The automatic floor bolt and horizontal compression drop seals are self-activated by simply moving the panels toward one another. The unique wheel-and-ramp assembly automatically locks the panel into place without the need to kneel and lock it manually. These innovations enable PrivaSEE to achieve its high sound ratings. Our team of in-house architects collaborated with experienced design professionals to develop an extensive line of interior aluminum extrusions that create a variety of visual statements from minimalist shadow lines to bold two-piece design features. The growing and evolving collection includes simple reveals, corner, and base transitions.